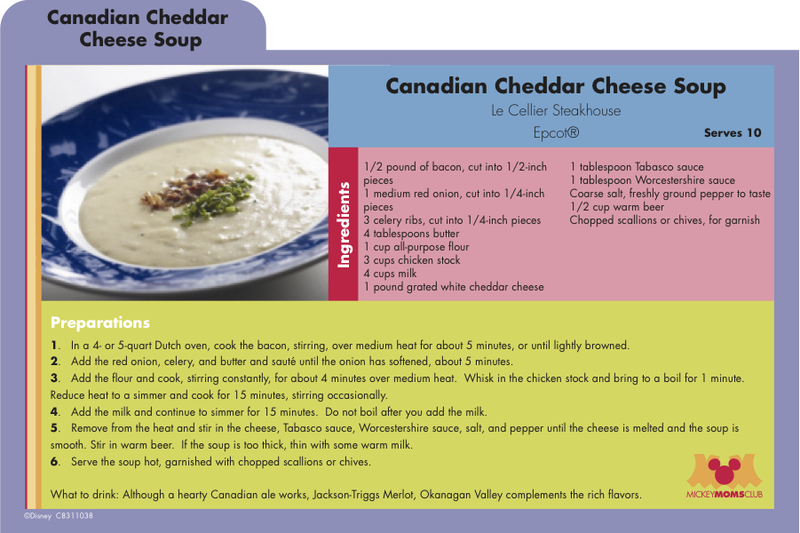 Le Cellier Cheddar Cheese Soup - Vegetarian Style! Ever have those days- when you just SUFFER from Disney withdrawals? Well... this past week has been like that! I'm stuck right between Disney trips. I mean, seriously folks, its been 8 weeks since my last Disney Trip. That's TWO Months! And I have almost a whole more month before I can return. What do you to alleviate those blues?? Well, I turned to the best thing I could think of: My Cooking with Mickey and the Disney Chefs cookbook! Ok. You know me. You KNEW it had to do with food. But, it couldn't be just any Disney recipe. 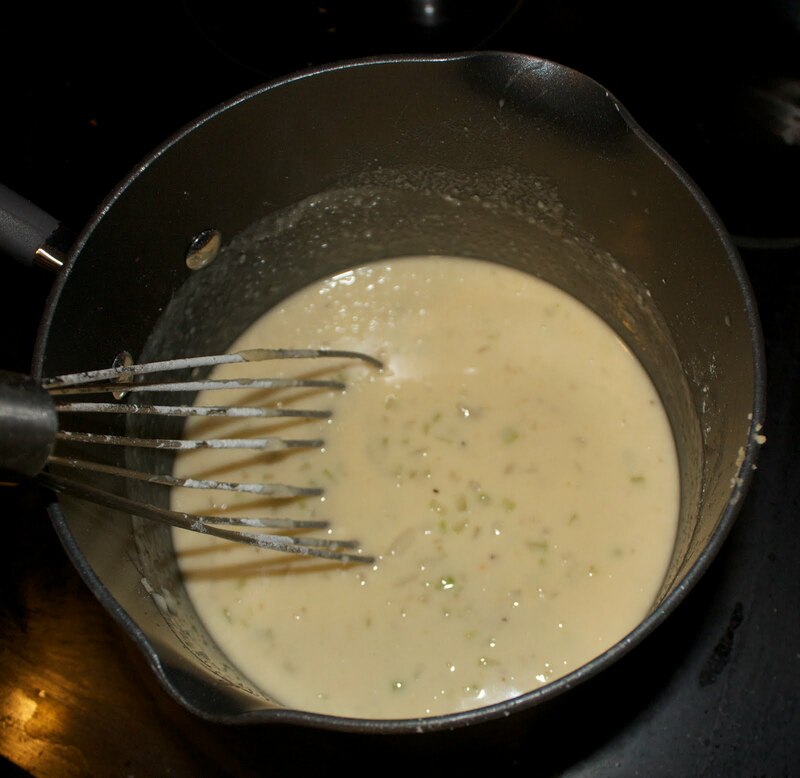 It HAD to be a pretty darn famous one: Le Cellier's Cheddar Cheese Soup. And being from New England originally, any reason to scarf down some Cabot Extra Sharp Cheddar is good for me! Of course, there had to be a few modifications. We had to vegetize this recipe!! 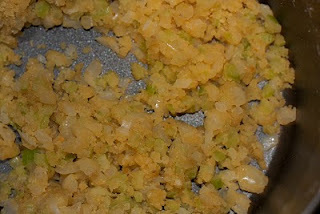 Toss that in the pot with a little butter (light butter ;) ), and saute. 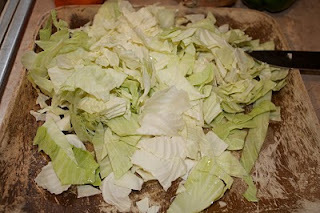 Once things are looking good there and the onion and celery are tender- whisk in the flour. Since I eliminated the bacon, I decided to add in just a bit of olive oil at this point too..
Then of course, its time for some creaminess: Milk. Yes, lowfat. And, yes, I know... I'm taking all the fun out of it. And- guess what. Time to simmer again. At this point it WAS torture. MMMM, the smell! It was already looking pretty good, and I didn't even add the cheddar yet! Then, at LAST, it was time for a few finishing touches: Worcestershire Sauce (look for a fish-free version! ), Tabasco and CHEESE! Oh, and a little beer to finish it off! Ready to try it at home? Go for it!! Here's the original recipe- straight from the Mickey Moms Club! LOL! It is mysterious- it posted by itself while we were eating dinner!! It wanted to be read!!! 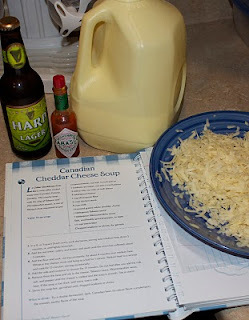 I don't do cheese but love reading recipes! For the smokiness from bacon vegetarian style, try adding a bit of smoked paprika (pimenton). Nice to see a vegetarian version! I have tried myself to vegetarian-ize this recipe. I sautee the onion and celery in canola oil but I bet the butter makes it better! 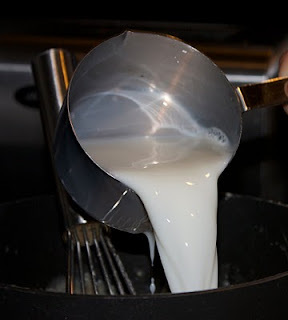 I use whole milk and vegetable broth and the sharpest cheddar cheese I can find. I serve this on Christmas Eve to my family with some crusty sourdough bread. 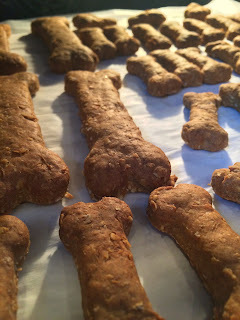 I would love to make pretzel bread - got a recipe for that?